Issue number 2 for Volume 48 (2018) of the journal has gone to print and is available electronically at the publisher’s site. 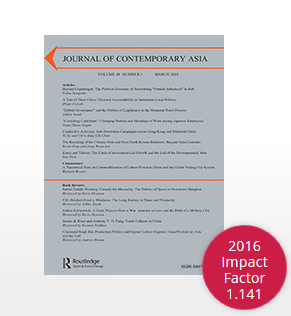 This number is a special issue, featuring two additional research articles and book reviews. This entry was posted in Uncategorized and tagged Alice Ba, Ben Hillman, China, Claudia J. Kim, Colin Mackerras, Helen E. S. Nesadurai, Indonesia, Islamic finance, Juanita Elias, Lena Rethel, Marco Bünte, migrant workers, military base closure, Myanmar, Nippon Foundation, Robert H. Taylor, Shaun Breslin, South Korea, Southeast Asia, Thailand, Tibet, United States, women, Xinjiang. Bookmark the permalink.